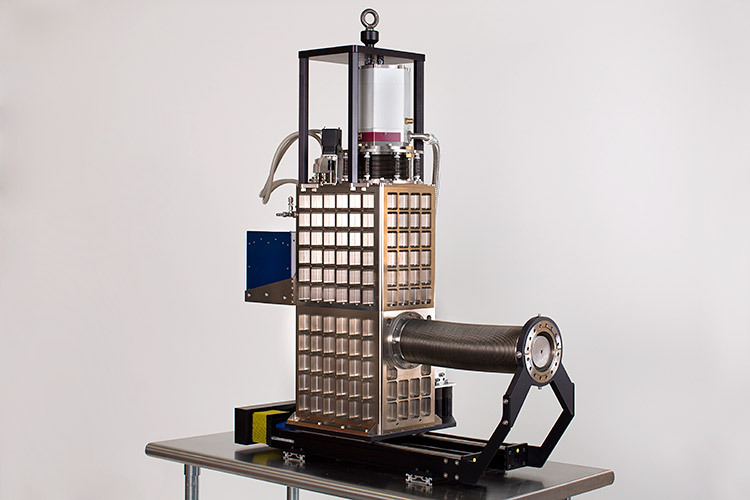 The Superconducting Tunnel Junction (STJ) X-ray spectrometer is a high-performance low-temperature detector produced by STAR Cryoelectronics for the synchrotron science market. The STJ detector is optimized for fluorescence-yield absorption spectroscopy (PFY-XAS) in the UV/soft X-ray range between 50 eV and 3 keV, and for high photon flux as encountered at synchrotron facilities. With a resolution of < 10 eV FWHM at 525 eV and count rate capabilities exceeding 10,000 counts/sec/pixel, the STJ detector offers 10 times better resolution than typical solid-state detectors such as HPGe and Si drift detectors while maintaining high QE and count-rate capabilities. STJs are well-suited to synchrotron experiments due to their relative simplicity and stability compared to other low-temperature detectors, along with their ability to manage high photon fluxes produced at modern facilities. Individual pixel spectra of a multi-element sample from a 32-pixel STJ. A histogram of pixel resolutions is inset at the top of the figure. Some emission lines are labeled by element. With sub-10 eV resolution, the STJ detector is able to isolate most close-by emission lines that would not be resolvable with traditional solid-state detectors. 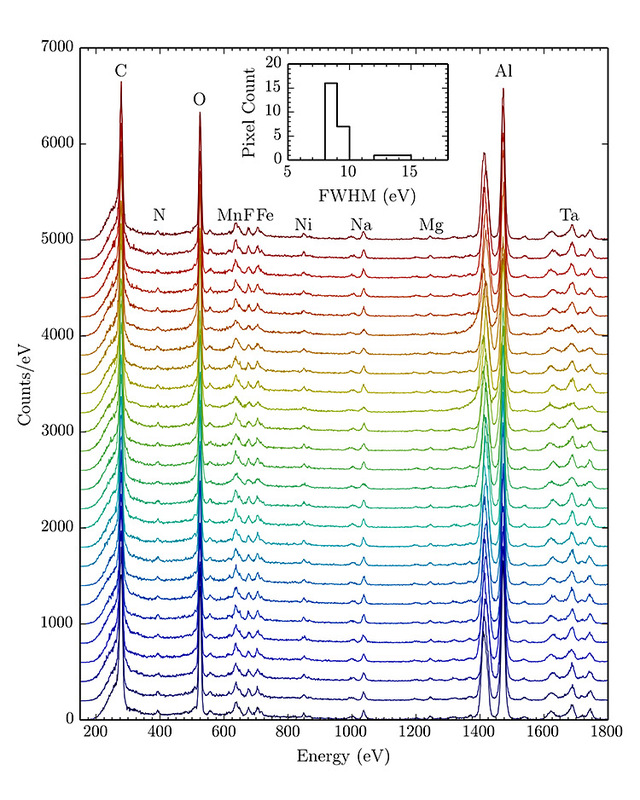 As seen in the sample spectrum, the emission from Mn and Fe L lines is completely resolved from the F K line between them at 677 eV, allowing low-background extraction of the PFY-XAS from each species. Other difficult lines that the STJ can resolve include V, Cr and Ti L from O K, or W or Ta M from Si K. High-resolution operation is possible up to 2,000 counts/sec/pixel, while rates over 10,000 counts/sec/pixel yield a resolution of around 20 eV FWHM. X-ray transmission through standard IR filter stack. The detector is built around the STAR Cryoelectronics DRC-100 cryogen-free adiabatic demagnetization refrigerator (ADR) cryostat, providing complete computer control of the system. Unlike many other types of low-temperature detectors, the STJ only needs to be below a threshold temperature value of approximately 250 mK to function. Hold times between ADR regeneration cycles can exceed 60 hours for the mini-snout version at an operating temperature of 200 mK, and regeneration takes about 1.5 hours. 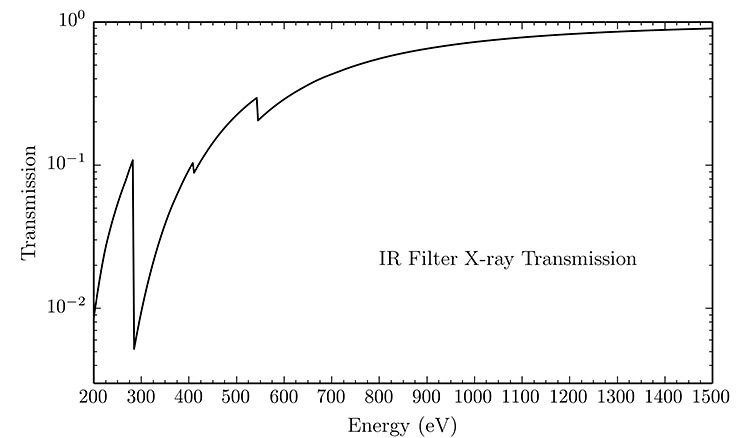 A stack of three IR filters protect the chip from room temperature blackbody radiation, admitting over 90% of X-rays over 1 keV for the standard filters. Filters optimized for low-energy transmission (with reduced hold time) are also available. The detector is offered in two configurations depending on the experiment needs. The full-size detector has a 112-pixel chip mounted on the end of a 42 cm-long, 72 mm-diameter cold finger that may be inserted into the analysis chamber to bring the detector up to 1 cm from the sample. Each pixel measures 200 μm x 200 μm square for a total area of 4.48 mm2. 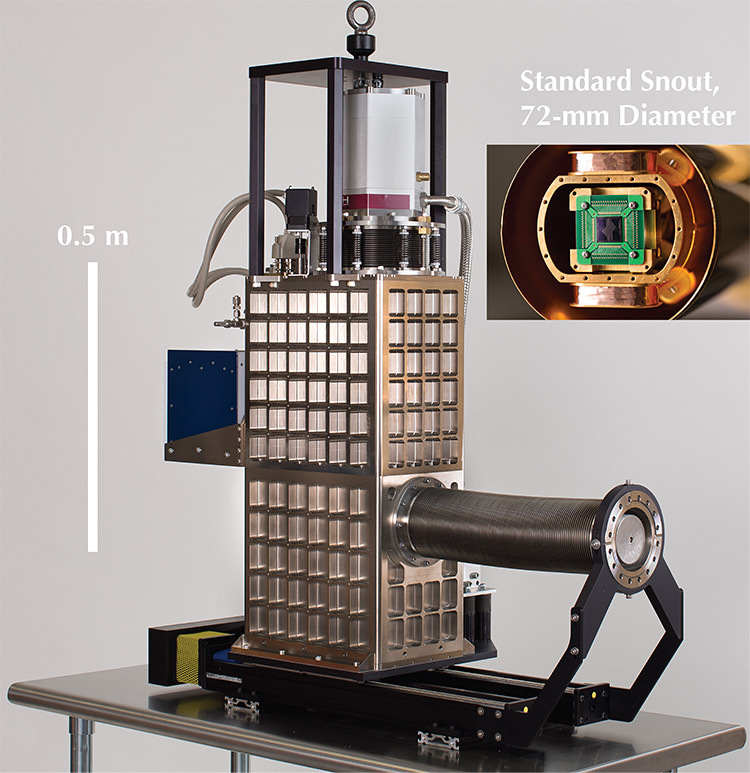 The full-sized STJ spectrometer with 112-pixel array and 4.5 mm2 sensing area. 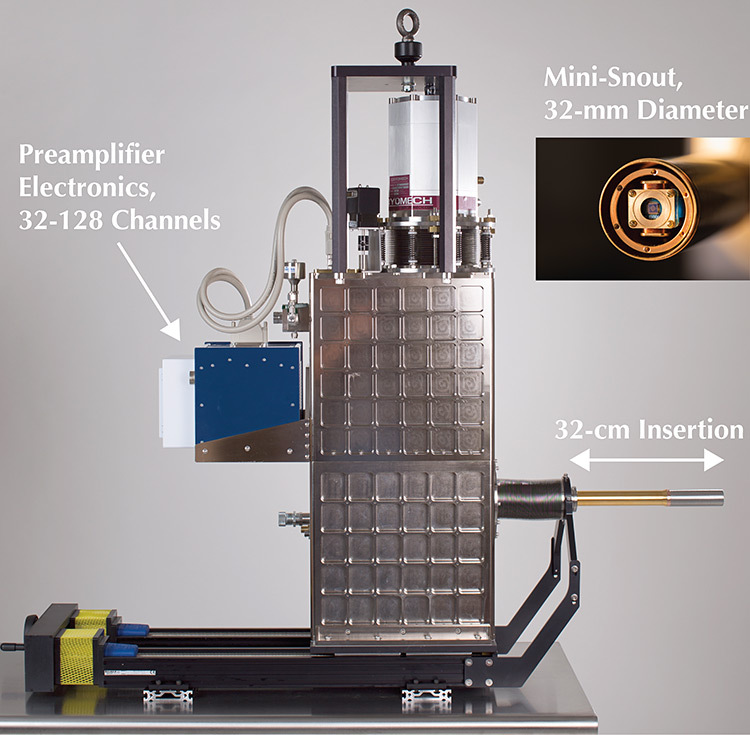 For experiments where space is tight, a mini-STJ version is offered with a 32 mm-diameter snout and 32 active pixels, which fits through a standard 2.75-inch Conflat vacuum flange. Both versions share vacuum with the experiment chamber to eliminate a vacuum X-ray window, and interface with the chamber via a 6-inch Conflat flange (standard STJ) or 2.75-inch Conflat flange (mini STJ). The detector is carried on a linear slide with 32 cm throw, and may be fully retracted from the chamber and isolated with a gate valve. The cryostat is available in two heights from flange axis to the bottom of the linear slide, with a standard 33 cm height and a shorter 22.6 cm height. The mini STJ spectrometer has 32 active pixels and can fit through a 2.75-inch Conflat flange. Detector electronics and pulse-processing hardware are provided in collaboration with XIA LLC and allow full computer control over detector biasing and tuning. XIA offers an HTTP API to the processor to integrate the detector with beam line control software. All spectra from all pixels are recorded separately to allow offline analysis if needed.